One of the most curious questions about Ray Bourbon I’ve been trying to sort out for several years is how he became friends with Bob Hope. There are several second-hand reports that Ray knew Hope and that Hope attended shows at Ray’s nightclub in Los Angeles. Ray’s lawyer, in an interview about a decade after Ray’s death, mentioned Hope as one of the Hollywood stars he called at Ray’s urging, asking for help, noting that Hope, indeed, knew Ray, but didn’t want to get involved because of the potential bad publicity. Ray himself, in his autobiography, doesn’t mention Hope. So, what’s Ray’s connection to Hope? A few weeks back, I started going through some of my material again, doing some new Google searches to see what new information might pop up – I have to do this periodically as newspaper archives and books are digitized and indexed. Typing in a search for comedian Marshall Walker and “Whizbang Review”, which Ray mentioned in his trial testimony as one of the shows he worked in, might have turned up the Bob Hope connection. Here’s the excerpt from James Bawden and Ronad G. Miller’s book, “Conversations with Classic Film Stars- Interviews from Hollywood’s Golden Era“. 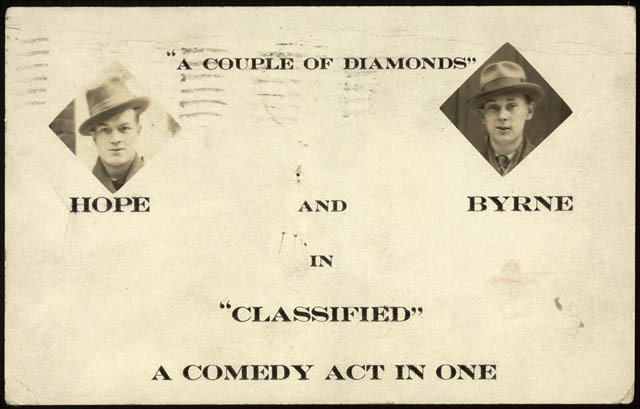 Business card for Byrne and Hope, ca. 1925. Bob Hope Collection, Motion Picture, Broadcasting and Recorded Sound Division, Library of Congress. Miller: You and Byrne went into a broadway show called Sidewalks of New York at the Knickerbocker Theater in 1927, which allowed you to display your dance act in the big time. What happened? Hope: It was so bad that were were advised to go back to Chicago and start all over again. We stopped in Newcastle, just to break the jump. The manager asked me to introduce the next show, which was Marshall Walker, a Scottish comic, and his Whizbang Review. I knew Walker, so I kidded around about him to the crowd, saying he was so cheap that he got married in his backyard so the chickens could have the rice. Every time I introduced Walker, I added more jokes. So by the time I finished the nine shows there, I was doing a whole monologue and they just kept laugh. Miller: Going from bad reviews for your dance and raves for your introductions of Walker must have been a wakeup call for Bob Hope. Now, it makes sense. This would have been around the time that Ray was kicking around vaudeville. Since Ray mentioned this comic and the Whizbang Review specifically in his trial testimony, it must have been memorable for him after all those years. And it might have been memorable because that’s where he first met Bob Hope. Of course, if until we can find another source to confirm my theory – a photo of Ray in the cast with Hope or perhaps some mention of Ray in the show with hope in a program, newspaper article, or other source, it’s just a theory at this point. Site © 1997-2019, Randy A. Riddle. All rights reserved.